Content strategists are critical to business success. In addition to helping organizations create relevant content, they often are called upon to help spot content production bottlenecks, improve authoring performance, detect existing content challenges, and develop plans for content overcoming content creation, management, and delivery challenges. They're the connective tissue between the organization, its content development teams, and the communication products provided to both prospects and customers alike. 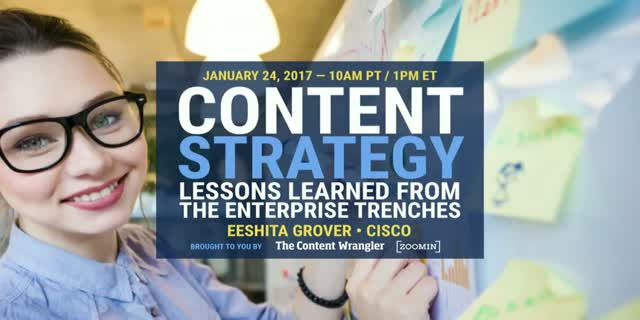 Join Scott Abel, The Content Wrangler, and Eeshita Grover, Senior Manager, Technical Communications at Cisco, for this free, one-hour webinar about the evolving role of the enterprise content strategist. Attendees will learn what makes a successful content strategist, how the role fits into an organization, and how content strategists can impact the customers they serve. Key takeaways include a discussion about the various skills required to become a content strategist, the tools necessary for planning a content strategy, and how to build buy-in for content strategy projects with upper-level management.